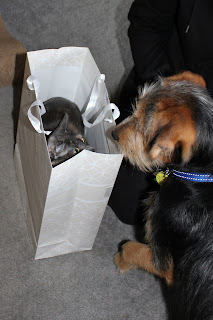 I'd like to reveal a secret, to "let the cat out of the bag." I'd like to, but the cats aren't telling. Anyone who knows cats can probably tell you a few things about cats and bags. As in, cats go in them. Actually, it's kind of hard to prevent. If you put a bag on the floor, somehow a cat magically appears--and then disappears. Inside the bag. It's as if every bag comes equipped with a Cat Signal that is automatically set off and is detectable only by those of the feline purr-suasion (couldn't help it). "Attention all Cats. This is an official Bag Broadcast Alert. A bag has been placed on the kitchen floor. Proceed to the area immediately to stake your claim. This is not a test." And, after you've experienced a few bagged cats, you realize pretty quickly, one doesn't really let a cat out of a bag. You can try to encourage it, or perhaps entice it out of a bag. Maybe startle it into leaving, if you should choose to be so cruel. But letting it out? The cat wants to be in there, and is quite happy, thank you very much, to stay in place. And, you see, when a cat is in a place, it owns said place. But the specific attractiveness of Bags remains a feline secret. A mystery wrapped within an enigma and hiding inside a paper Stop 'n Shop bag. Or a Land's End tote. Or any number of variations on the theme. You can buy expensive cat toys and cat beds, but nothing beats a good bag for a whole bunch of kitty fun. Below, Dawn and Athena demonstrate the affinity of cats for bags. But they're not explaining why. That's a secret. 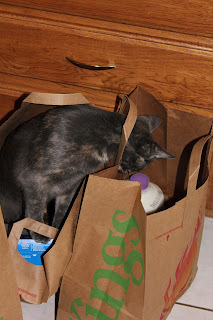 Grocery bags are fun to explore, as Dawn demonstrates. Perhaps because there are groceries in them. And it is unthinkable that you might have gone shopping and not bought something tasty for the cats. Of course once a bag is empty of groceries, you can fill it with a cat. And if you're another cat, you must pounce on the Bag 'O Cat. It's The Law. 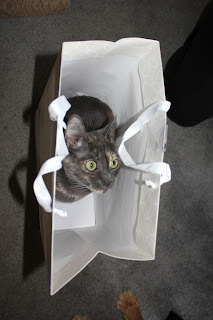 While Athena supports and approves the usage of reusable grocery bags, paper is fun too, because it makes that nice crinkly noise when you climb in. And when you climb out. And when you climb in again. Sometimes it's hard to decide which is the Best Bag to be in. That other bag has M.I.L.K. "This bag is occupied!" Jasper looks on from above, having no doggy idea what all the excitement is about. It's important to realize that Dawn did not back into that small bag; somehow she managed to go in--and turn around. A canvas LL Bean tote is claimed by Athena. "Just try, Dawn. Just try." Athena only hangs out in the best Bags. Gift bags are a perfect fit. Because there is a Gift inside the bag. A Cat. Whose presence is always a Gift. Tucker would like to investigate the Gift. But it seems to have sharp pointy edges. And it hisses. 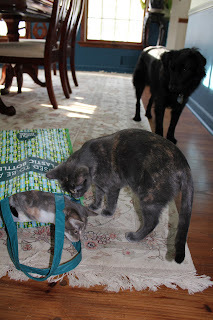 Lilah, who we sometimes think is part cat, is still a bit puzzled by the whole bag cult. But it must be something pretty darn awesome, if Dawn's Happy Cat Face (actually, it's officially Hidey Face) is any indication. I love the way you write, Susan. It's always a lot of fun to read you! Thanks, Florence. 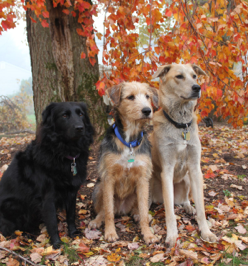 Even though you're far away, you'll at least know what's happening with the 4-legged creatures in our home.